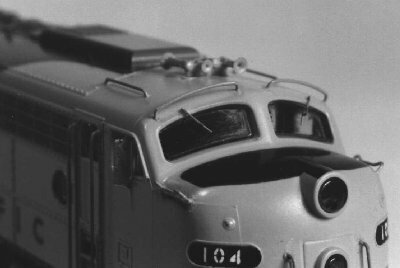 Diesel Loco Detail Set: 36 windshield wipers, 76 lift rings, eight cab sunshades, and eight rear view mirrors designed for diesel locomotives. Of the wipers, 18 are large, for use with hood units, while the other 18 wipers are smaller for use with cab units plus low-nose hood units. Sunshades are for hood units, mirrors are for passenger locomotives. The lift rings can be applied to the roofs of all diesel carbodies. These are etched in .005" stainless steel eliminating the need for painting.